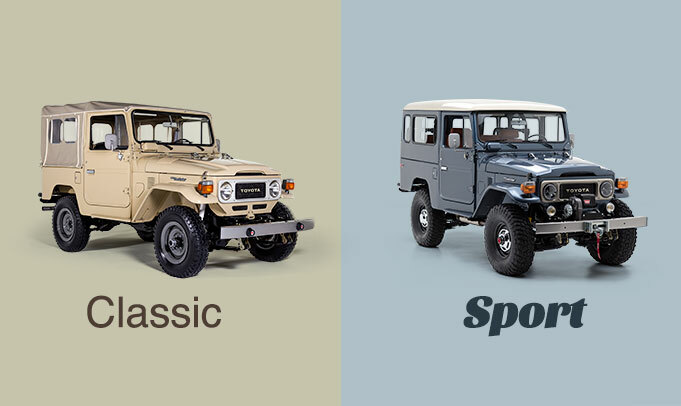 The FJ45LV is one of the rarest models in the Land Cruiser 40 series. Production began in 1963, but was discontinued in 1967 and replaced by the FJ55. One of the things that makes an FJ45LV so unique is that Toyota assembled the running gear and chassis but used an outside coach builder, Gifu Auto Body Industry Company, to construct the LV's distinctive long body. It is estimated that only 5,000 LV's were produced, making it something of an urban legend among collectors. We've all heard the stories and seen the pictures, but it is increasingly rare to see one in the flesh. For FJ40 or FJ43 builds, please place an order through our website. For those seeking something a little more exotic, this is our inventory of rare Land Cruisers available for one of our full nut-and-bolt restorations. We DO NOT sell un-restored vehicles.